Mera Peak (6421m) is one of the highest permitted in Nepal and also one of the frequently visited and demanded trekking peaks among the tourists who come to Advent Himalaya Treks. The peak is located to Everest region. It is located to the south of Everest. Mera Peak itself rises to the south of Everest. 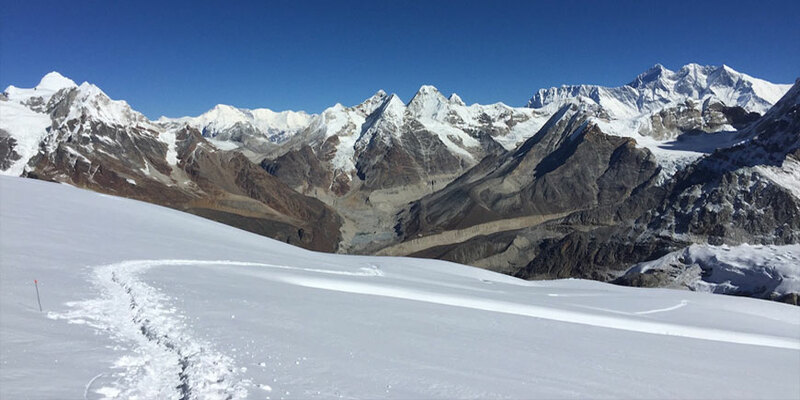 The ascent of Mera peak is technically straightforward, however, the heavy snow and the maze of crevasses can make the way longer to the summit. The first ascent of Mera Peak was made by Col. Jimmy Roberts and Sen Tenzing on 20 May 1953 but the region was first explored extensively by British expeditions in the early 50's. Members of those teams included Edmund Hillary, Eric Shipton and Geroge Lowe. Dolpo TrekkingThe most rewarding aspect of the trip to Mera peak is that you will have a chance to venture into little-visited and as yet unspoiled areas in the region, where the hillsides are still densely forested. Furthermore, during the peak climbing one can have an opportunity to explore the rich Sherpa culture their tradition specially in the Hinku valley. Mera peak is not only famous and highest peak in Nepal, but you can have better chance and have feeling as if you are on the top of the highest peak of the earth, as the Highest peak of the world Mt. Everest (8848m) is rightly in front of you, so as, you can have views of other highest mountains namely, Mt. Lhotse (8516m), Mt. Kanchenjunga (8586m), Mt.Makalu (8463m),Mt. Cho Oyu (8201m) and other mountains lying along the Everest region. The trekking for the Mera peak climbing can either began from Phaplu, or Lukla or Tumlingtar, whereby, it is easily accessible by some 30-min direct flight from Kathmandu. Day 01: Early morning flight to Lukla (2840m) Overnight in Lodge. Day 02: Lukla to Chutenga (3050m) O/N Lodge. Day 06: Thanak Rest for Acclimatization Camp. Day 11: Khare to Kothe (3700m) lodge. Airport pick up and transfer to hotel. Please click on small photos to have larger view. Advent Himalaya Treks P. Ltd.